Now we have moved Glow Blogs into the 21st century we are going have some fun. The idea of the bootcamp is a place were folk can get help in starting or improving their class blogs. The bootcamp will take you through creating a blog, adding features and a range of blogging activities. Classes will have the opportunity to link up with other glow blogs and the world wide blogging community. Each week there will be ‘technical’ tips, blogging challenges and discussion points that can be carried out in your classroom and on your blog. What you need: A Class, somewhere to blog (glow for example). No technical knowledge needed. While most of the technical support will be aimed at glow users the bootcamp is open to any classroom. 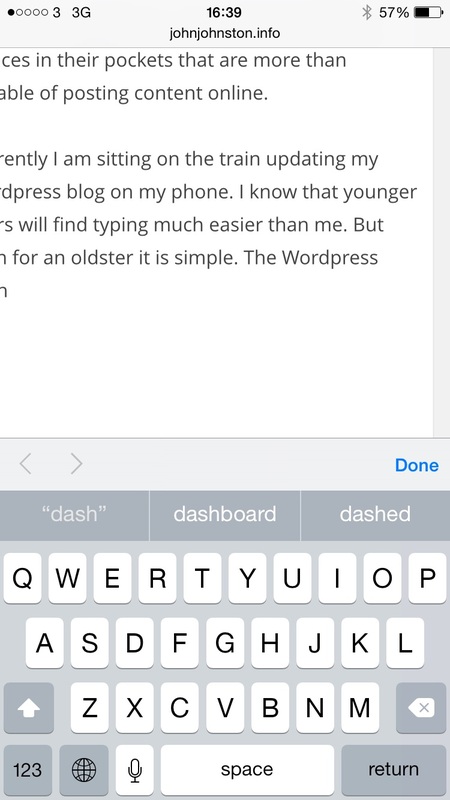 On of the real benefits to upgrading glow blogs to WordPress 4 will be its mobile interface. When WordPress 2.9.2 came out in 2010 we were just into the start of the mobile web and the term responsive web design had just been coined. 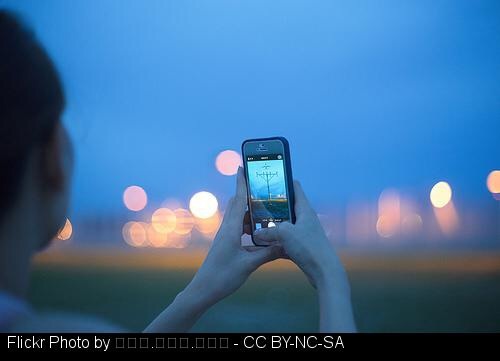 Now a large percentage of the population have devices in their pockets that are more than capable of posting content online.
. 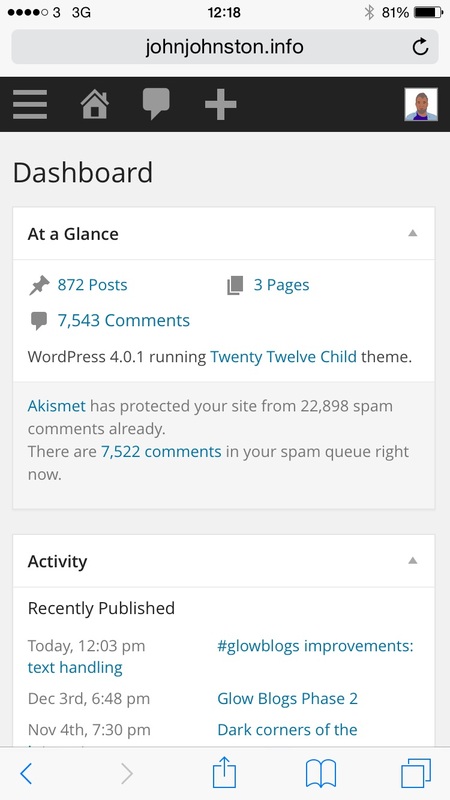 The WordPress dashboard now is responsive resizing and rearranging the tools to fit on my screen. 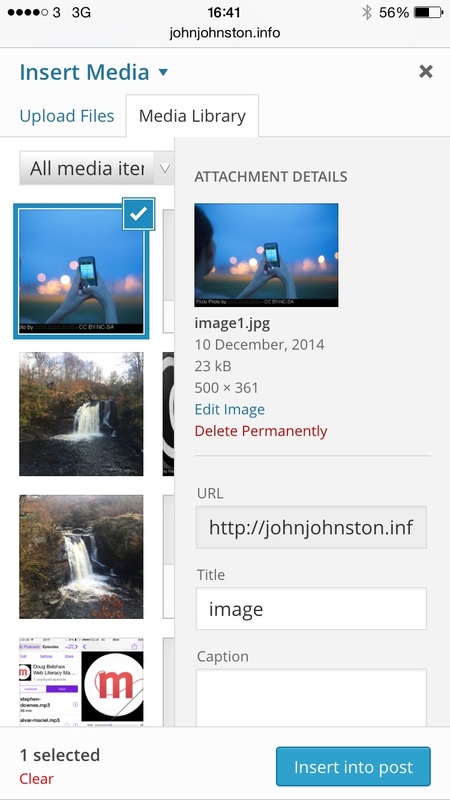 Adding an image is simple and a gallery is easy enough. 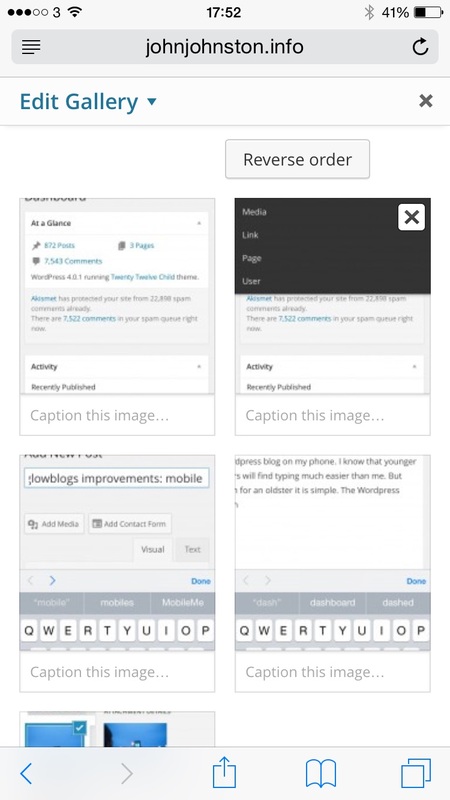 WordPress now lets me select several images to insert in a post or create a gallery. This post was started in the train, continued on the tube platform and finished on the couch all using my phone. Personally I am not the greatest typest on any device. Many folk will be faster. 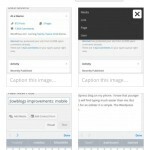 Or I could start a post while mobile, capture images and save that as a draft for later. 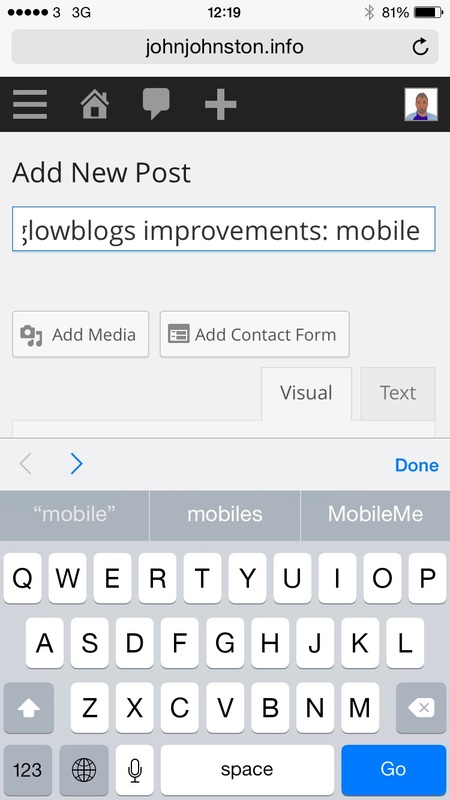 I am looking forward to seeing how glow bloggers go mobile next year. We have just announce the hope that phase 2 of the Glow Blogs project will go live sometime in January next year. This is a wee bit later than our original plans. Personally I am not too disappointed as I can see how hard the team across the Scottish Government and Code For The People (as was)1 are working. Before I started this business, I could not really see what all the fuss was about, surely all we need to do is upgrade WordPress and all would be well. And that would be fine if it was one blog, dealing with, and sorting out any wee snags and glitches. But width >130000 blogs we need to try and make sure, as much as possible, that the blog owners don’t have much work to do. 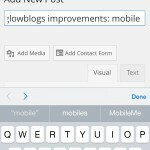 A major benefit of the newer version of WordPress should be making people’s lives easier it would be a bad start if they need to do a lot of work to keep their blogs looking the same. Here is an example or two of the work that is being carried out. The Anarchy Media Player plugin was used to display video and audio on Glow Blogs. This plugin is no longer supported or updated. 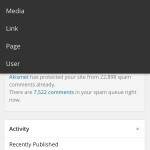 Much of its functionality has been improved on in core WordPress. 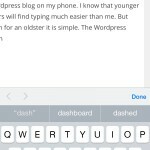 WorpdPress now lets you upload or add a link to audio or video and choose to link to the media or embed it. If we just turn off the plugin that would result in existing links to media, that are embedded, just being presented as links. If we leave it in folk may continue to use the features which may not survive any future upgrades. After a bit of though the developers have produced a slimmed down version of the plugin that will continue to change links into embeds. This new version will not however present buttons on the posting tool bar and encourage its continued use. Hopefully this will smooth the upgrade experience for some people. The old glow blogs had an upload file limitation of 8mb, this has been increased to 50mb which should help people to post small videos and reasonable length audio files. There will be extra cost in hosting the files and we want to balance this out a bit. In the old blogs quite a few folk ran out of space just by uploading un-edited image files. A plugin, resize at upload plus was added to the service in the hope that people would turn this on, images would be resized and very large sizes would be remove. In the new setup this plugin has been updated and will be turned on for all blogs. The images will be resized down to 1200 pixels maximum width. This will ensure that images will still look good but trim some size of the rather large images that come out of digital cameras. 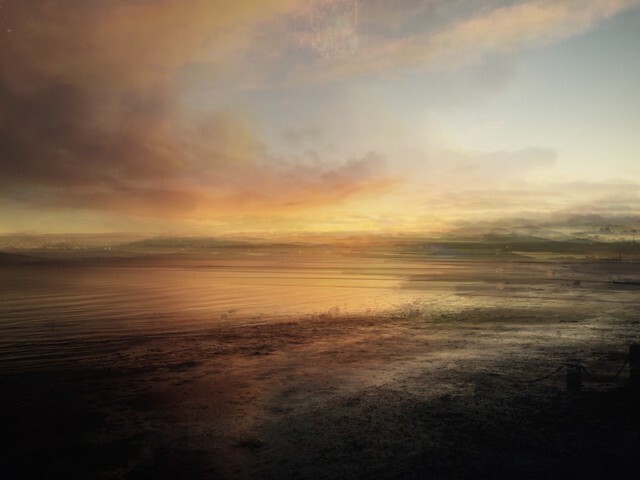 This resize can be turned off, just in case someone want to have a photography blog and allow huge images to be stored. These are just two of many changes that the team are working on. There is also the effect of the upgrade on the themes used on blogs, particularly the > 60 profile/e-portfolio themes. 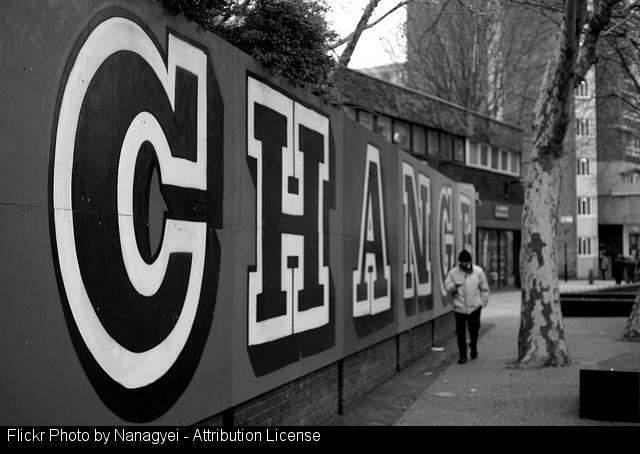 Each change needs a fair bit of discussion and work from the developers, each bit of functionality needs to be tested and all the other functionality need to be tested to see if the change has unforeseen consequences. 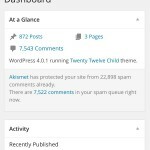 This is going to improve, WordPress has always been regarded as a good bit of software from an end user perspective. Improvement however means change. I am confident that these changes will make things a lot better, but habits will need to adapt. Hopefully we can explain any points of possible pain before the upgrade. We will be changing centuries in software terms, 2.9.2 was released in 2010 version 4 came out this year. As usual I am more than happy to discuss any aspect of glow blogs, please get in touch if you need more information. 1. 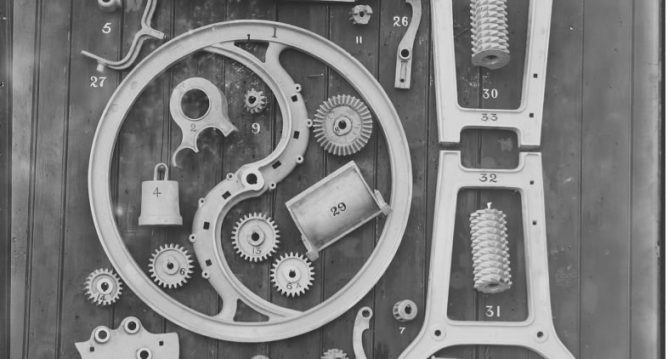 Code for the people have joined the WordPress.com VIP Team at Automattic! They still are working on the Glow project. Last Friday at the same time as the glow authentication changed, the new glow blogs service went live. I posted about this over on Glow Connect. It was pretty exciting stuff, the developers were really working right up to the last minute and beyond to deliver the service. Even so we have gone live with a few know issues and have already discovered a few more. At the start of the processes I certainly was not aware of all the complexities involved nor the scale of the job. Turns out it was a big complex job! Luckily for me I ended up working with an amazing team, not only in the Scottish Government, but in the developers and suppliers. All of them worked long hours with very positive attitudes as I grumbled along. I am tempted to turn this post into a list of these characters and their qualities, but probably enough to say all of the blog team were essential to the process. At the end of this phase we have a working set of WordPress MU, one for each Local Authority, running the same version of the software as before and we have the known issues linked above. The main improvement so far is around blog creation. There is no connection to SharePoint/old glow groups. This simplifies the process a great deal. This and other Main Changes are listed in the Glow Blog Help, some of these are not improvements but changes. One more improvement, not listed, is that you can now upload files of up to 50mb to blogs. This should make it a lot easier to podcast or share small videos without using a third party site or service. On Wednesday I popped back to North Lanarkshire to watch my colleague Ann McCabe set up a class of e-portfolios, this was much quicker than before, taking away at least half the steps. There is still plenty of room from improvement and I got a great idea to take back to Victoria Quay from the RM help desk who I visited in the afternoon. Given the above, if this was the end point in the process I’d be pretty disappointed. A lot of work for not much in the way of improvement. I am not disappointed due to two things, phase 2 and phase 3. Phase 2 was looking quite simple, upgrade to a new version of WordPress. This will bring a host of benefits, better user experience especially on mobile being the main gain. More important, in the longer run, is that it gives us a much better base to develop on. The other aspect of phase 2 will be to backfill in things that were dropped out of phase one or needs that were discovered in phase 1. It looks like phase 2 will take a bit more work than I expected, but this will start straight off. Already some of the first problems to be discovered has been solved and the developer team are just waiting to decide when to deploy the code. Another potential ongoing problem with server load is now beginning to be understood and the team are working on finding the best solution. The team are keen that the server gets a chance to bed in and are suitably cautious about changing things on the live system, best practises for ongoing change and development are being put in place. After we get to phase 3 of the project things might speed up a bit. 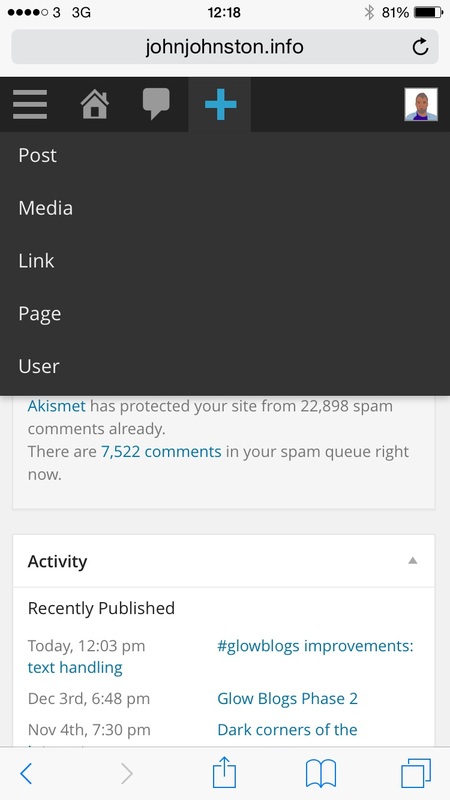 We will be using WordPress 4 which will allow a lot of nice things to happen. The one I am most excited about is giving a more flexible service. In the old glow blogs it was a constant frustration for myself and many others that our theme and plugin requests were never answered. I am not entirely sure of all the reasons for this, but having peeped behind the curtain I presume some of this was to do with testing. The glow blogs system now consists of 4 main servers: integration (where new code is added after code review), explore (for testing), pre-production (more testing) and live. With the older version of WordPress we are using a lot of the development and testing is manual, the testers here and volunteers going through lists of test to test the functionality of the blogs. In addition there is security, load and a many more tests. Going forward the process should be automated, the newer version of WordPress can have a deal of automatic testing, code going onto the integrate server would be pushed through the different servers being automatically tested on the way, this gives us the possibility of a much more agile service. On Friday last week there was a fair amount of cheering and happy faces around the glow office, since then feedback has been mainly positive. I am not really ready to celebrate yet, there still is a lot to do before we reach the point learners and teachers in Scotland have a world class blogging platform. There so many possibilities out there for doing all sorts of things with WordPress. We would, of course be really interested to hear of any ideas of what you would like from Glow blogs. Along side the blog migration for Glow I’ve been working on the wiki procurement. Wikis were part of the services added to Glow in 2010 (AFAIR) along with blogs and forums. When it came to think about the new services and migration wiki migration was not in the plans and wikis were not on the map of new services. The previous wiki solution was not particularly well used, around 4000 wikis were created over the projects lifetime (compare to >130,000 blogs). The software behind the wikis was mindtouch. This is now discontinued and I believe missed a few features that make wikis useful in the classroom. 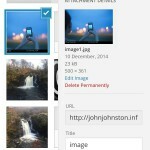 These included nice themes and a simple workflow for uploading and embedding images. It was decided to look at the possibilities for continuing to have wikis as part of the glow offering. This might seem counter intuitive as O365 sharepoint sites can be though of as Wikis and certainly have wiki pages as part of sites. I think a separate wiki offers a simpler way of building on the internet and it is also important to have the facility to make a wiki public in some instances. Personally I’ve had enough success with children publishing publicly on the internet that that would be my default position. Other teachers and educators may prefer closed environments and glow can provide for both. As part of the process of provisioning wikis we evaluated many different solutions, wikispaces stood out as the best fit for our needs1. Wikispaces was also mentioned frequently by the folk who responded to our wiki survey. No other product was mentioned favourably. As part of procurement three different vendors were invited to tender and their tenders evaluated against a set of requirements. Wikispaces were the best fit and their tender has been accepted. It has been a while since I used wikispaces in the classroom but it looks like they have added a lot of classroom specific features to the service without over complicating the process. I am not exactly sure of how the wikis will connect up to glow but look forward to working on that development in the coming weeks. As always I’d be interested to see how learners and teachers in Scotland are or would use wikispaces. 1. Personally I like wikitext and enjoyed using wikis that are not WYSIWYG but I think I am in a minority on that one.